Southern Command Recruitment 2015 – 02 Lower Division Clerk & MTS Posts:- Civil Defence Service, Territorial Army Group Headquarters (HQ), Southern Command, Pune has published latest notification for filling up 02 posts of Lower Division Clerk (LDC) & Multi-Tasking Staff (Peon). Desirous & eligible candidates can apply in prescribed application format within 21 days from the publication date of advertisement. Age Limit: Between 18 to 25 years. Relaxable for Government servant up to 40 years (for LDC post) & 35 years (for MTS post) as per order/ instructions issued by the Central Govt. 01. Lower Division Clerk (LDC): 12th Class or equivalent & computer typing. 02. Multi-Tasking Staff (Peon): Matriculation or equivalent. Date of Advertisement: 07/11/2015 to 13/11/2015. Last Date : Within 21 days from the publication date of advertisement. Application Procedure: Eligible candidates can send their application in prescribed format along with all essential documents by registered post to Territorial Army Group Headquarters, Southern Command, Pune – 411001 within 21 days from the publication date of advertisement. 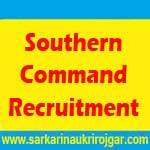 Subscribe our free job alert mail for Southern Command Recruitment 2015.